Amid the killer-cold shivers, and cabin fever inducing winter time blues exists a ray of hope. 20th Century Cincinnati is a warmth radiating across the barren landscape of a mid-western winter. 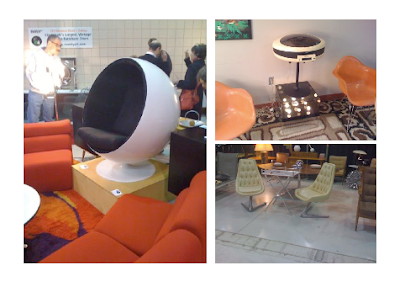 The show returns in 2010 with a fist-to-the-jaw lineup of top-shelf Mid Century Modern dealers. 50 of them to be exact. That's epic. We attended last year's show. Decisions were made then to show up every year. 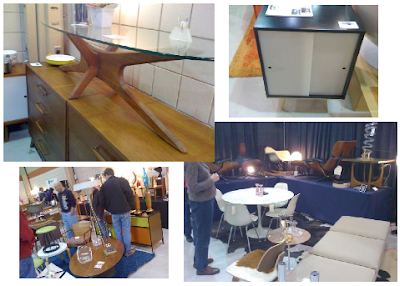 Below are some shots we took of the Mid Century Modern goods being peddled last year. This is not just a furniture show. Expect a wide variety of things - jewelry, pottery, dinnerware, lighting, accessories, textiles, posters and art. A great thing about the show is there truly is something for everyone. Beginning collectors (those there for the first time who are just looking for something interesting to get the MCM ball rolling) and seasoned collectors looking for higher end stuff will all be in heaven. Prices range from the ultra-cheap to the mega-cash. Deco to disco is pretty well covered. We've created a Facebook event to keep up with who's attending. This will be an easy way to plan meet-ups and carpools. I'll be easily spotted in my trademark Vintage Roadside t-shirt. Wow! I may have to fly in special. And see you, of course. I'll be there! I need a new collection bowl for key parties... heh. This show was under serious consideration but instead we're using 2 free airline tix to go see some of the Cincy relatives in Florida that weekend, where they have a condo... near the beach.... 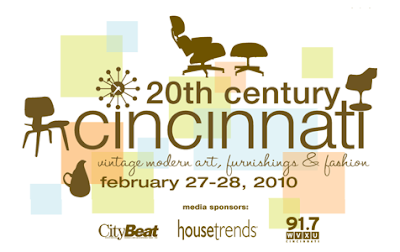 Hoping all the MCM enthusiasts will be in Cincy while I scarf up all the MCM steals in Ft. Myers thrift and antique stores that weekend. Have fun! My husband and I (homesweetsplitlevel.blogspot.com) and a couple of our Nothcrest friends are making the trip up from Atlanta for this! We are so excited! 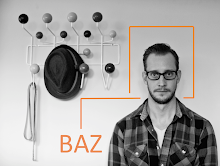 We love your blog and actually found it a while back while researching for the show. if that turntable is still there, you must steal it for me. Spacify offers a wide selection of quality Modern Furniture to decorate your home.